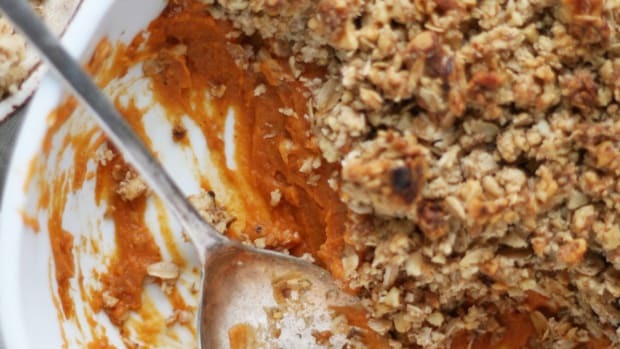 Sweet potatoes might just be the most perfect vegetable. With a vibrant color that ensures antioxidant power, versatility in the kitchen, and delicious flavor, sweet potatoes are hard to beat. These roasted sweet potatoes are a delectable way to enjoy this popular root vegetable. 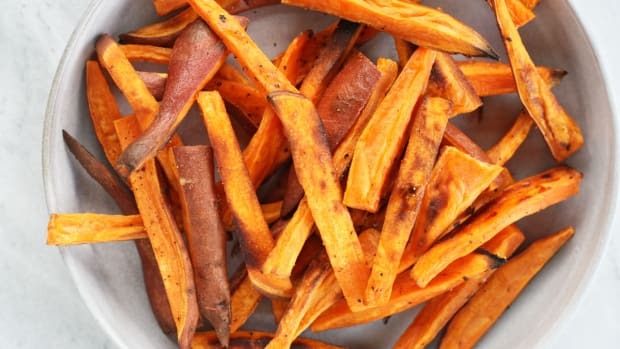 The trick to making perfectly roasted sweet potatoes is to use both high heat and a high heat cooking medium. 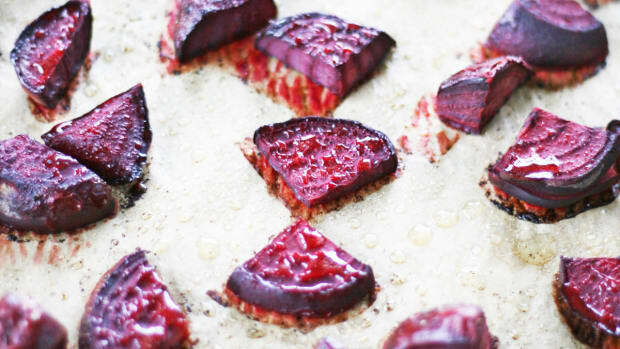 This, along with cutting the sweet potatoes pieces into roughly the same size, is a surefire way to cook perfect potatoes, bursting with healthy benefits, every time. Sweet potatoes, of all types and colors, are filled with beneficial macronutrients and micronutrients. Just one cup of cooked sweet potato yields a vast array of beneficial vitamins and minerals, complex carbohydrates, and satiating fiber. This provides 214 percent daily value of vitamin A, 44 percent daily value of vitamin C, and substantial amounts of B vitamins, iron, potassium, magnesium, manganese, and copper. 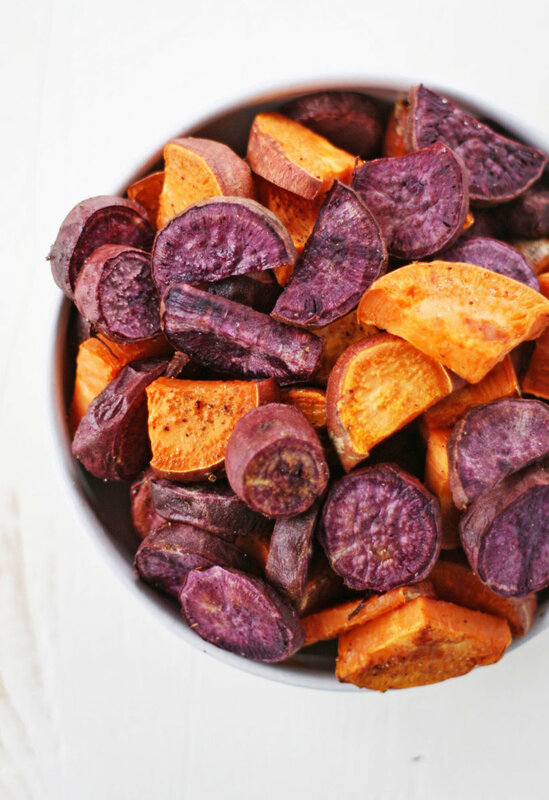 Vibrantly colored sweet potatoes contain a variety of different antioxidants including beta-carotene, chlorogenic acid, anthocyanins (specifically in purple sweet potatoes), and coumarins. These plant compounds are thought to beneficially affect our health by reducing and removing free radical accumulation and damage to cells. Sweet potato is a rich source of soluble and insoluble fiber. Soluble fiber helps to increase feelings of fullness while slowing down blood sugar spikes and fluctuations. Insoluble fiber is associated with improved gut health and reduced risk of certain diseases, like type-2 diabetes. 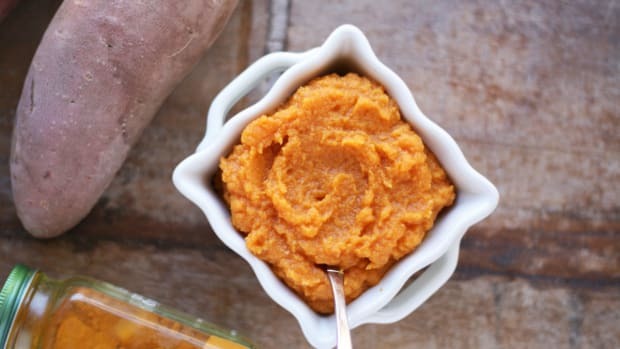 First thing first, stock up on organic sweet potatoes at the farmers market or grocery store. These inexpensive tubers are often labeled as either yams or sweet potatoes, but are usually varieties of sweet potato. Yams, which hail from Africa, are often hard to find and are much starchier and drier than their sweet potato cousins. 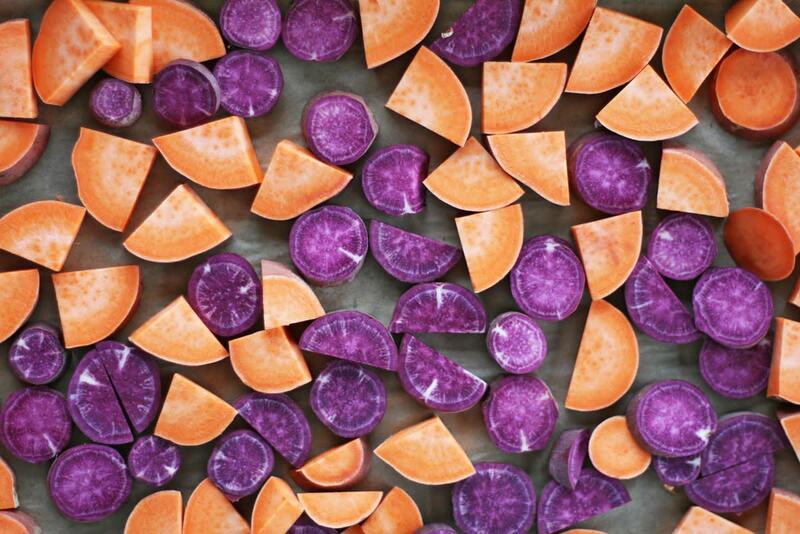 Sweet potatoes come in several sizes, shapes, and colors with names like Hannah, jewel, garnet, Korean purple, creamsicle, willowleaf, and more. 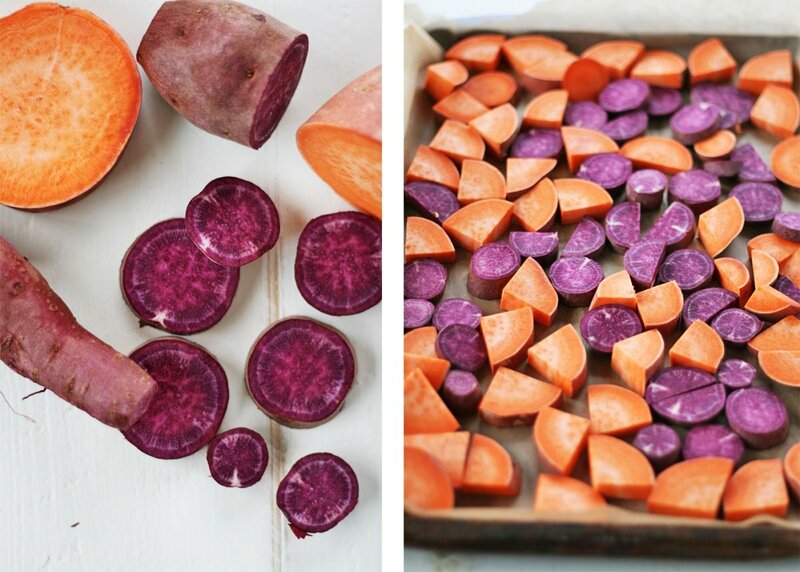 For roasting purposes, I prefer to use purple sweet potatoes (which are gorgeous), garnet, and jewel varieties. Sweet potatoes need high heat to roast perfectly, and with that a cooking medium that tolerates high heat. When roasting sweet potatoes, I prefer to use ghee or avocado oil, two mediums that have very high smoke points. Ghee, or clarified butter, provides a nutty and buttery taste to roasted sweet potatoes second to none. Ghee also contains vitamins A, E, and K, along with butyrate, a type of short-chain fatty acid thought to promote the health of gut bacteria. Ghee has a smoke point of 480-500 degrees Fahrenheit, meaning it is suitable for high-heat cooking and roasting. Avocado oil, which is made from pressed avocado, has a smoke point of 520 degrees Fahrenheit. Along with providing essential B vitamins and healthy fats, avocado is versatile cooking oil that makes roasted sweet potatoes shine. These roasted sweet potatoes are delicious straight from the oven (blow on them first to not burn your mouth! ), but there are other tasty ways to enjoy them, too. Top roasted sweet potatoes on a quinoa and salad bowl. Yum! Have them for breakfast. 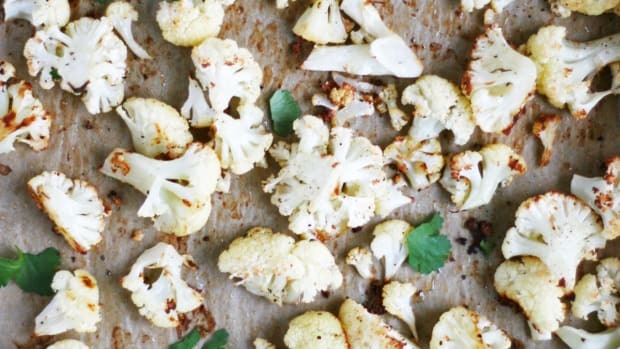 Serve alongside yogurt, sautéed apple, cinnamon, and almond butter for a perfect morning meal. In an updated take on a classic: sweet potato salad with red onion, dill, celery, and lemon juice. Turn them into sweet potato nachos. 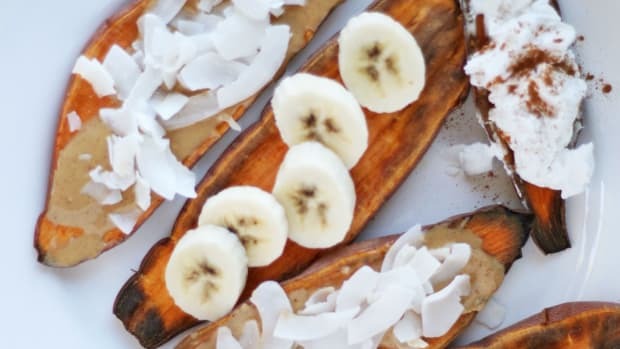 Top them on overnight oats or chia seed pudding. 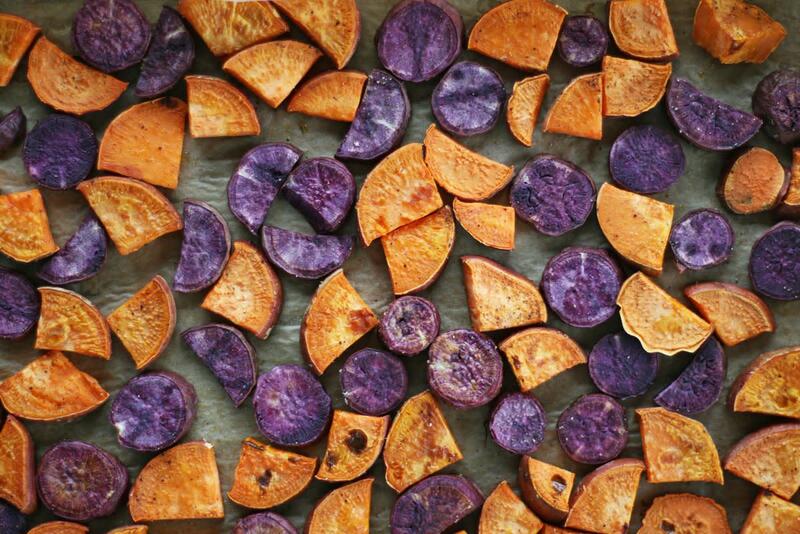 Bake these roasted sweet potatoes into a quiche. 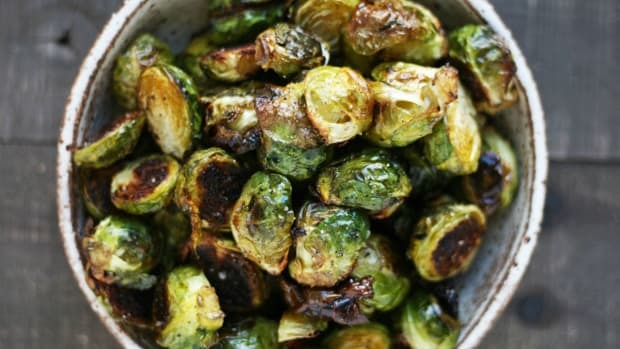 Place them in a mason jar and take them on the go as a quick snack. 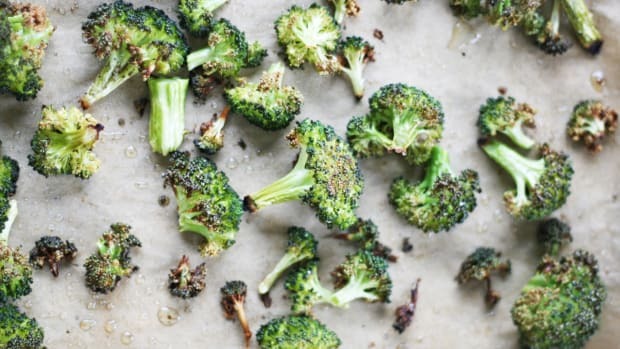 Sprinkle them with a variety of different spices to enjoy as a perfect side dish: cinnamon, nutmeg, cumin, cayenne, or oregano are delicious choices. Put them in tacos or a quesadilla. Turn them into dessert by topping with a cinnamon pecan crumble. Preheat oven to 425 degrees Fahrenheit and line a baking tray with parchment paper. Wash and scrub each sweet potato. Cut each sweet potato into roughly the same cubed size. Place sweet potato on baking tray and drizzle with avocado oil or ghee, sea salt and pepper, and optional spices, if using. Roast in the oven for 20 minutes. Remove from oven and stir the pan well. Roast an additional five to ten minutes, or until sweet potatoes are fork tender. Remove from the oven and let cool slightly before eating. Enjoy!